Just four short weeks ago they had intercepted a garbled communication originating from this system pleading for aid. Upon arriving they were hailed by the planetary governor of Hephestus IV. He explained that they were dealing with a rebellion in one of their hive cities, assuring the marshal that he had everything under control. Augustus would not take no as an answer however. While was readying a council to understand the situation, they mysteriously lost communication with the surface. The bridge of his battle barge was in motion as they realized they had been led into a trap. The orbital defenses turned against them and battered his small fleet but they held strong. In a matter of minutes the orbital defenses with naught but scrap and the jamming had ceased. That was yesterday, he reminded himself. Today the enemies of the Imperium of man would be brought to justice and this world would be cleansed of treachery! Lord Governor Trusk looked blankly at the pict screen displaying his orbital defense array, astonished they had been obliterated so quickly. He began barking orders to his officers to get the secondary defense systems online before the Astartes could make planetfall. 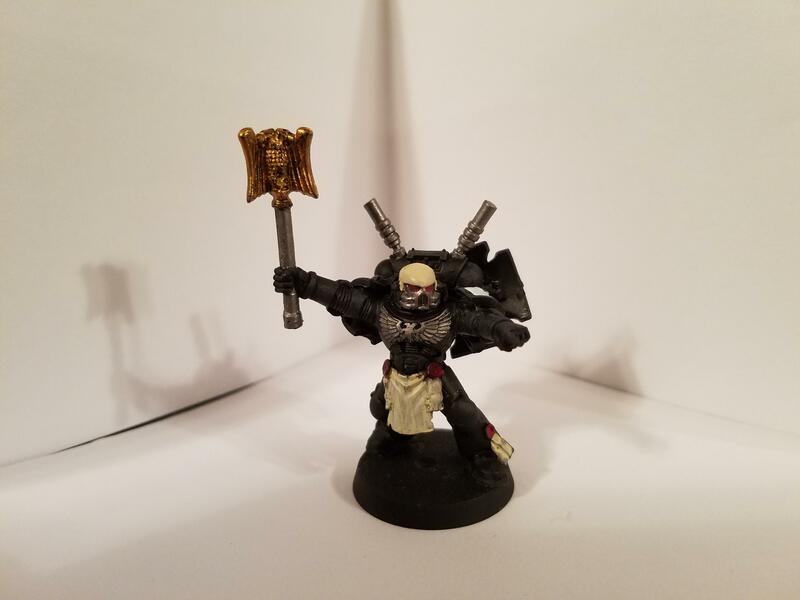 These Black Templar as they were so called were crafty, he thought, but none would stop his planet's deliverance by his gods beyond the stars! Trusk and his followers worked too hard to have all their plans ruined by some pesky crusaders! For the third time he cursed the rebel leadership for finding a means of sending a distress signal offworld but what was done was done. Now was the time for action, and these black templar would find the world very much under Trusk’s command. - 2 crusader squads with 5 initiates 1 with meltagun 4 with chainswords, sword brother with power axe, and 4 neophytes with combat knives. Moved one crusader squad up into charging positions for next turn while the other secures objectives, the assault marines jump into a flanking position. Moved up his plague throwers and kills a few neophytes, caster uses vitality on closest unit in anticipation of charge. 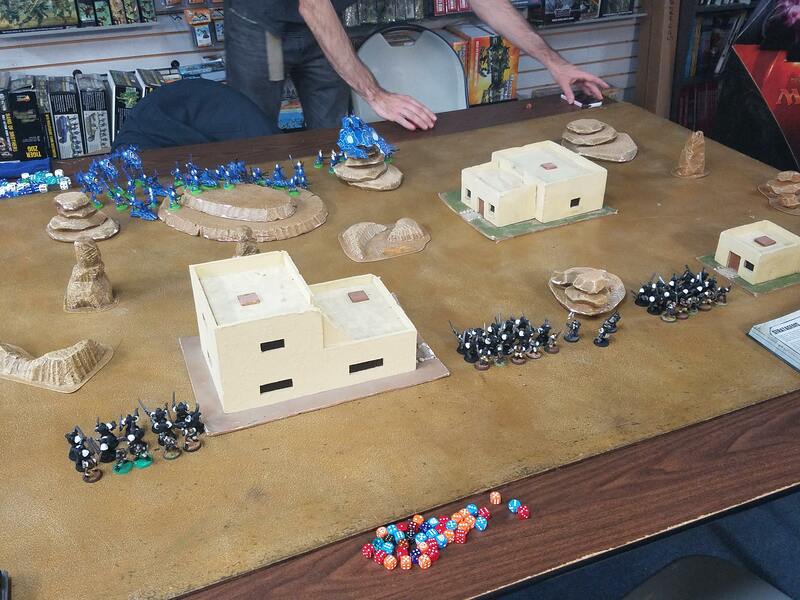 Crusader squad 1 Moves into position to charge along with Chaplain and apothecary, whom revives a neophyte. The assault squad moved around to flank the other plague marine squad to tie up both units while the last crusader squad spread out to secure 2 objectives. Crusader squad and Chaplain charged into plague marines, killing 3 and losing only the neophyte that was revived, while the assault squad charges the other plague marines, killing 1 and taking one casualty in turn. Caster used smite and killed one marine in crusader squad 1, meanwhile chaplain and crusader squad fought the plague marines killing another and losing one of their own while wounding the chaplain. Plague marines kill Assault Marines to a man (the sarge). Lone assault marine withdrew over some cover while the Apothecary charged the other plague marine squad and healed the chaplain’s wound. Rest of crusader squad 1 died but Chaplain and apothecary managed to kill another plague marine. Realizing he only had one objective to my 2, the other unengaged plague marine squad makes a b-line to his other objective. Malignant Plaguecaster charged and used smite again, wounding my Chaplain twice, plague marines wound the apothecary. Hero assault marine charged the other squad to keep them from objective, but died to overwatch, meanwhile apothecary healed chaplain again while he wounded the Plaguecaster 3 times almost killing it but taking 3 more wounds himself. 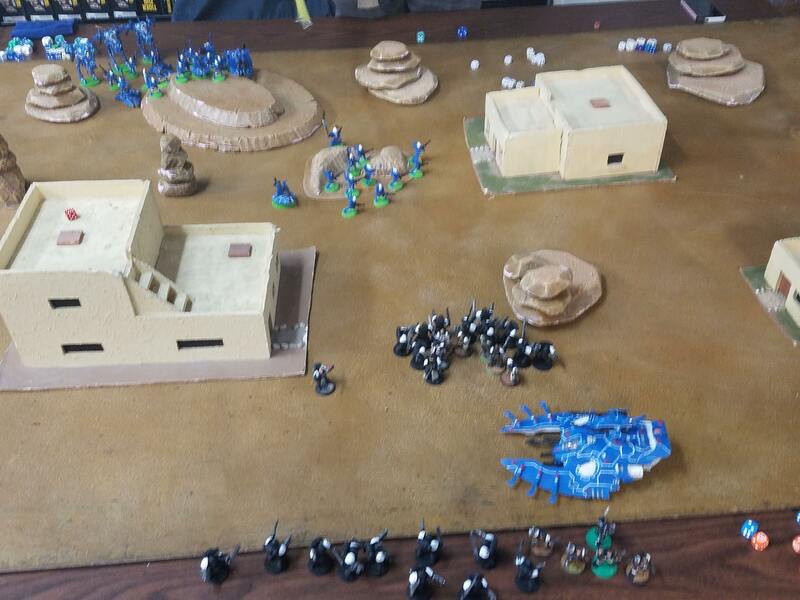 Caster used smite to finish of chaplain, but hoping his d3 victory points would win him the game he consolidated his forces on his objective forsaking the other while taking pot shots at my remaining squad, killing the neophytes. Plague marines finished off my Apothecary. Last remaining crusader squad consolidated on my 2 objectives while firing their meltagun at the other squad killing 1 final plague marine. With 2 objectives to 1 I was winning by 2 points and his d3 victory points only netted him another 1 so I just barely eked out victory by the skin of my teeth. Overall I'd say I had fun, this was my first game back since 6th edition so I was not on top of my game (didn't use a single strategem) but I learned quite a lot, for one meltaguns are terrible against Deathguard and I will grab plasmas next time, second the assault marines were not nearly as effective as I had hoped they would be and I may replace them in future lists. Edited by Marshal van Trapp, 28 September 2017 - 02:04 AM. Now on to those pictures that I promised! For now I give you the Original Command of the Purgation Crusade. Former leader of the Purgation Crusade prior to his untimely - yet heroic - death aboard a tyranid hive ship. Though reckless and headstrong in his youth, Augustus proved to be a formidable force through his training as a neophyte and eventually an initiate. He was appointed marshal after successfully defending an imperial settlement from Dark eldar pirates who were raiding the sector. Upon his elevation, he declared the Purgation Crusade, directed at cleansing the xeno filth from the imperium of man. My original Marshal, he's been all but retired but I can't bring myself to shelve him for good. 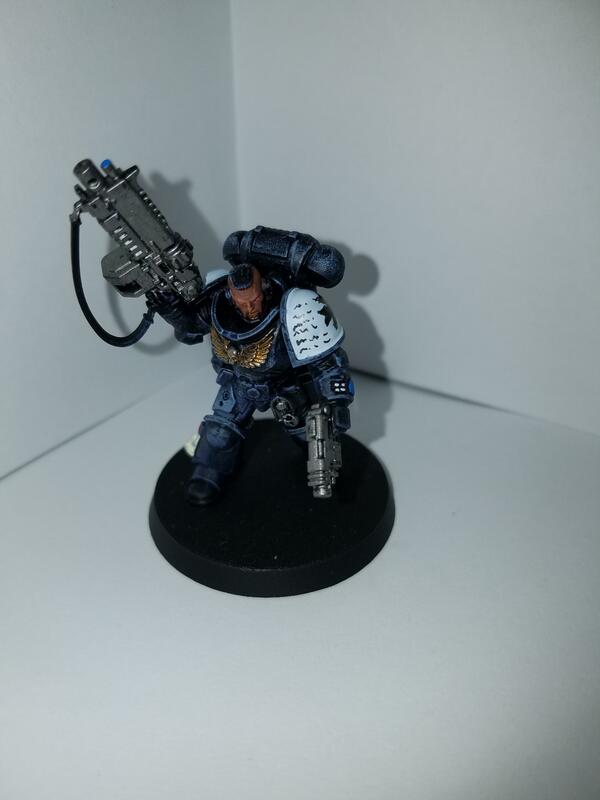 This model along with my chaplain were commissioned for me as a birthday present from my dad so I will probably always hold on to them, even if I don't use them in games anymore. Heinrick is the spiritual center of the Purgation Crusade. From him spills forth the rhetoric of the emperor himself, the grand deific being that watches over all of mankind. Heinrick is a cold, calculating man whom is never afraid to speak his mind to both his brothers and his Marshal. Before you ask, yes he is a blood angel chaplain. 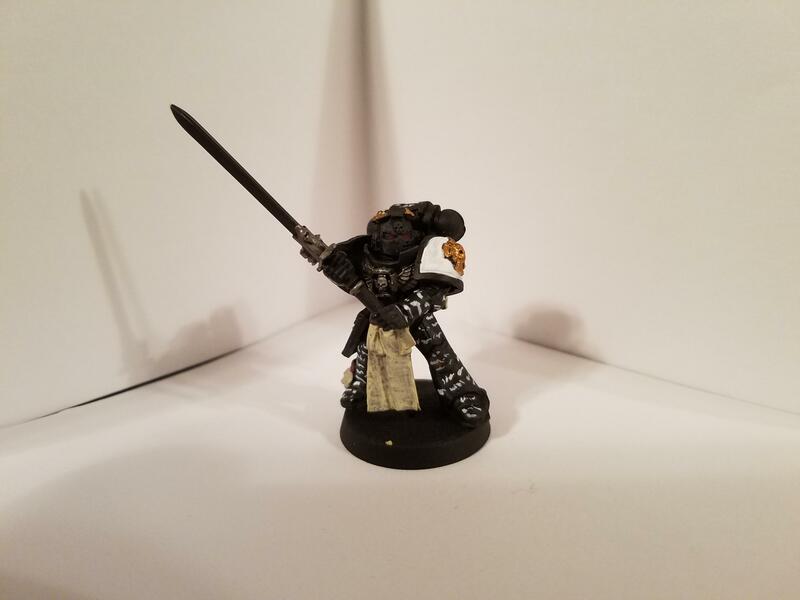 As with my marshal he was a gift, and since my father played BA, he had a spare chaplain and had it commissioned for my eternal crusade! The young chaplain Wilhard is Heinrick’s newest pupil. 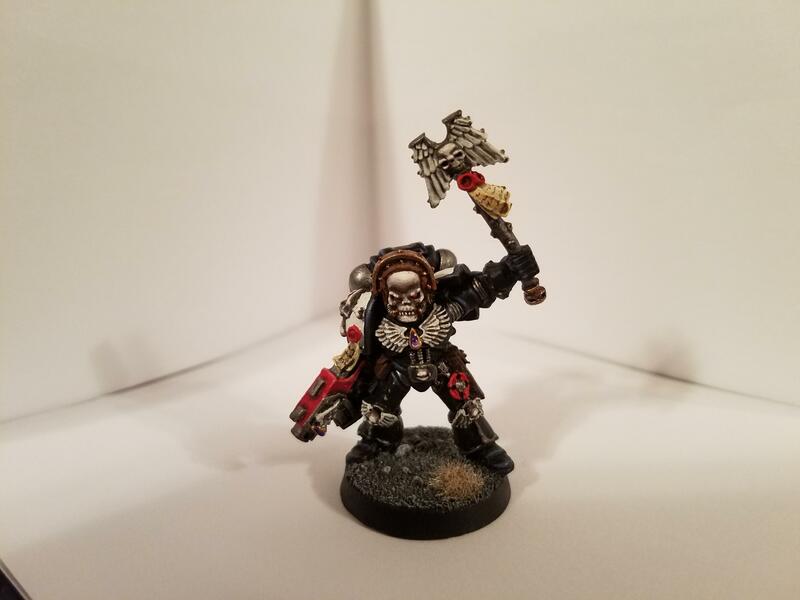 He has only just been elevated to the rank of chaplain but already he has taken to his charge with all the devotion of a Black Templar. He is still a headstrong youth, but with Heinrick’s tutelage he should make a fine chaplain some day. The last known Champion to take up the title was Champion Rodrick, however he, along with Marshal van Trapp were killed aboard a Tyranid Hiveship when they went on a suicide mission to kill the hive mind terrorizing the planet [record expunged]. Since then none have taken up the mantle however the armor and sword were recovered by Brother Argus and his Terminator squad. Now this guy I am super proud of, not just from the conversion, but the paint job as well. I took inspiration from here a lot for the painting ideas and I think it turned out pretty good if I so say so myself! Awesomeness.Congrats on the win and welcome back to the Emperor's Light. I am looking forward to seeing more. "There is no such thing as too much faith"
I'm loving all the old school chaplains. Play on brother! Is the white stripes on the Emperor's Champion's armor, meant to be devotional text inscribed into the ceramite? Edited by Marshal van Trapp, 28 September 2017 - 08:17 PM. The next bit of fluff is done, more of Marshal van Trapp's story is unfolding. I hope you guys enjoy it! “What news have you brought us Brother?” Marshal van Trapp had sent his most trusted sword brethren to scout the situation on Hephestus to determine his best course of action. The journey to the surface was not an easy one, the lord governor had turned the planet’s defenses on his crusaders so the safest way to the planet had been by drop pod. after securing their landing point Augustus had a perimeter set up and a makeshift war council was created. “Nothing good Marshal. it appears that most of the planet belongs to the governor, and what more horrible mutant monstrosities roam the hives, preying on any remaining loyal servants. Wherever these rebels may have gone, we have found no sign of them here.” Mutants roaming the hives unchecked? Trusk had clearly lost his mind, this was no longer about simply punishing treachery, Agustus knew that this kind of heresy must be cut out at the heart! “They have come to the surface my masters! It is only a matter of time before they know the truth, how we shall bring this filthy world its deliverance! Soon our saviors from the stars will arrive to free us from the yoke of imperial oppression and deliver us to salvation!” Trusk knew that they were listening. They were always listening. Watching. Waiting. Soon Hephestus would know freedom. YOU HAVE DONE WELL FOR US SO FAR. OUR GODS SHALL REWARD YOU GREATLY FOR YOUR LOYALTY. The thoughts sprang into Trusk’s mind. BUT ALL IN GOOD TIME. Trusk knew that there was still much work to be done, but he was so eager to finish so he could feel the salvation that was so promised him! The first attack came at dawn, fifty mutated humans - if they could even still be called human - crawled out of the hives and swarmed the Crusade’s command position. They lashed out with clawed digits and makeshift weapons made from old tools and as soon as they realized they were outmatched they retreated back into their hive. These attacks continued every few hours, probing at their position looking for weakness, and fleeing when they found none. After the third attack Agustus decided it was time to move out, if he could not find the rebels he would take the fight directly to the Lord Governor himself! And so it was that the Crusaders fought their way through the lower hives to the seat of the Lord Governor himself. Constant ambushes became the norm, but they would not be stopped by these strange mutant creatures. As they pressed further into the hive city Agustus noticed the sky was darkening slowly, clouds growing ever so dark and foreboding as they reached the gates of the palace. Inside they were shocked to find very little in the way of defense - expecting more ambushes - Agustus made sure his warriors were well prepared for the coming battles, for even he did not know what they might find here. “No remorse! No fear!” the assembled brothers echoed back. Agustus was proud his brothers fought with all the ferocity of their namesake. And yet… something still irked him. Their journey through the hive city to this point was not easy, but it was not difficult either. Again the sense for foreboding pulled at him but he knew better than any. He was a space marine, and he shall know no fear! They are here. Now it was time for his most loyal followers to prove themselves. And with any luck they would distract them from what was to come! Soon the great star gods would arrive to bring this planet it's so asked for “deliverance” but by then it would already be too late! Trusk looked over the pict screens before him, his carefully laid plans would come to fruition. He had kept his strongest warriors here with him in his grand palace and he now intended to utilize them to their fullest. With the help of his gods’ servants, these imperials would be doomed. As the sky above began twisting and churning Trusk grinned. The fools had fallen into his trap, and they were already dead! They sprung from their hiding to a hail of boltgun rounds. Nearly every warrior of Trusk’s elite guard lay motionless on the ground, crater sized holes blown in them. If this was all the traitor had to throw at him he wondered how he had ever wrested control of the planet in the first place. But then they came, alien monstrosities as fast as a space marine, with clawed hands that could rend armor from flesh from bone. Agustus knew what had happened to this planet at once. Genestealer cults. He had heard the term before but never before witnessed their effects. They infected the very populace of a planet, breeding loyalty in each new generation until the hive fleet came to collect… the hive fleet! They must have already been on their way by the time he and his brother Astartes arrived. The governor needed to be dealt with now, the Crusade had much bigger problems on the horizon. He and his brothers cut through the palace right to its heart. A shocked Trusk cowered behind his guards, “This world is our! We shall have our deliverance! Not even you will-” the sound of a bolter round cut through Trusk’s words as he fell to the ground, a hole blown straight through his chest. “We are your deliverance!” the marshal scoffed as he lowered his weapon. The remaining traitors were put down as Agustus received the transmission he knew would be coming. Unknown contacts detected enroute to Hephestus IV. Massive crafts that would surely be bringing the full force of a Tyranid invasion to the inhabitants of this world. Edited by Marshal van Trapp, 30 September 2017 - 11:38 AM. The next chapter is finished, hopefully you guys are enjoying my fluff, as I've been away this weekend I've not had time to do any painting but I've had plenty to write with. Without further ado I bring you Marshal van Trapp's next chapter. As Marshal Agustus looked out the view screen of the governor’s palace he knew what he would see. 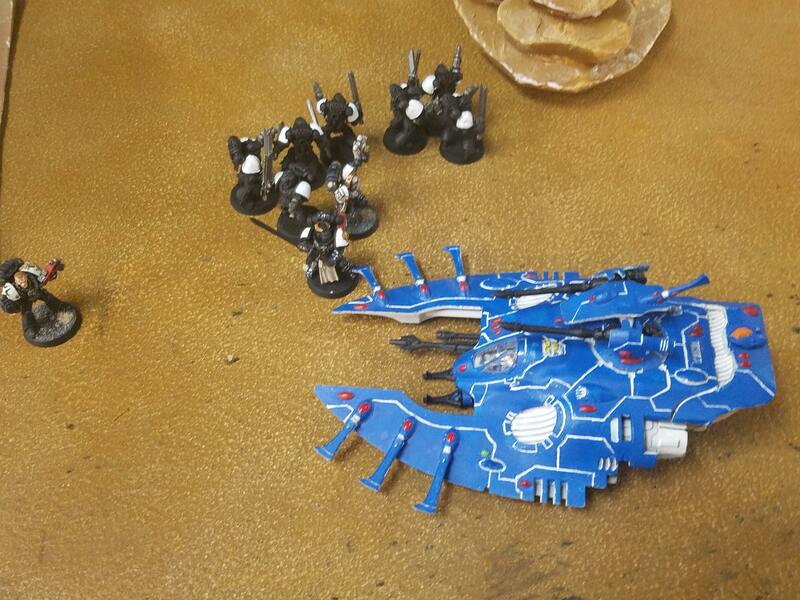 Spores carrying the Tyranid warrior organisms rained from the sky while fighting broke out between those still loyal and those poisoned by the genestealers. The ferocity of the hive mind was legendary, only a handful of instances were known of them being stopped. Agustus had faced their like before, he knew how they worked, and how to exploit their weakness. Without their hive beasts the lesser creatures would be thrown into disarray. The plan was simple, muster his forces and locate the Hive beast, then destroy it utterly. Although it was simple, it was no small task and would require his crusade to be just as ferocious as the xenos filth they aimed to kill. Agustus knew many of his men would not survive this assault, but it was the only way to beat these beasts. Reclusiarch Heinrick stirred the Crusade into a righteous frenzy and they set off through the city on the hunt for blood. After several hours of cutting through warrior organisms - and several losses - the Crusade reached their targets. A huge cluster of the creatures known as hive guards, protecting what was sure to be the leader of these creatures. The so called Hive Tyrant towered above the other creatures, making them look like ants around their queen. This was it, Agustus knew that it would all come down to this battle, and his men were ready! Agustus lead the charge into the press of guard beasts - lashing out with bolter and powerfist - as he smashed through carapace and sinew. As he neared the hive beast, he felt a strange sensation as he was lifted off his feet and flung through the air into his men. He knew of the psychic capabilities of the Tyranid but he would not let this witch-creature best him. He charged the monster, feeling the wave of force washing over him, but he fought through it gathering every ounce of strength he could muster. His muscles ached as he pushed on, lifting his powerfist to deliver an uppercut that would have decapitated even a brother Astartes. As he backed away, Agustus saw the creature's jaw hanging loosely from its hinges and the beast wobbled awkwardly. Another blow knocked out the tyrant’s knee as it collapsed before him. Marshal Agustus took a brief moment to survey the carnage around him, several of his brother marines held the guard beasts at bay while he dueled it. He returned to stare down at his prey as he felt another psychic blast churning the air in front of him ready to knock the marshal into the sky, but he brought his fist straight down through the creature's skull, splintering carapace and turning his insides into pulp. As the hive creature died a psychic scream ripped through the battlefield, sending the lesser hive beasts into a frenzy and the warrior organisms into a mad panic. 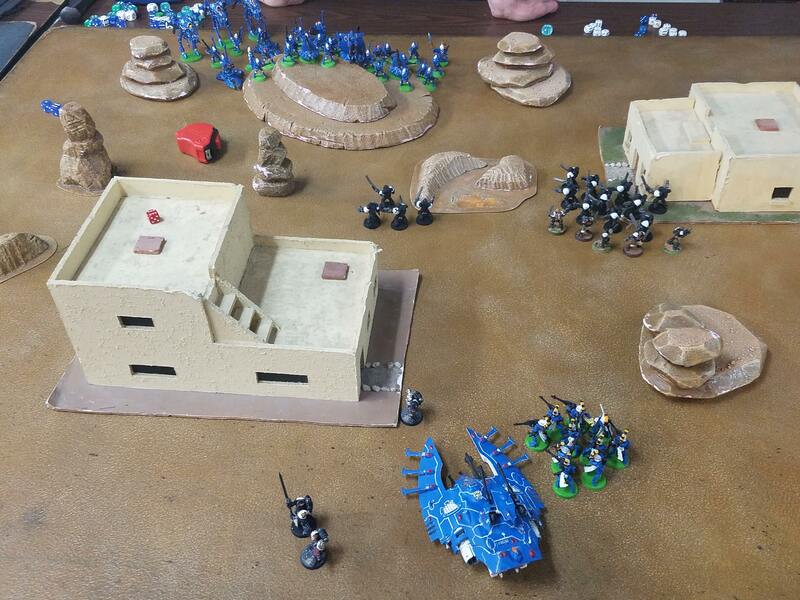 With the tyranid forces in disarray, Marshal van Trapp and his warriors massacred them where they stood. As the dust cleared the Crusade appeared victorious, though many had fallen the Tyranid army was in full retreat and Marshal Agustus allowed himself a moment of hope. That is until he received a communication from his battle barge in orbit above. The Tyranid army had retreated, but the hive mind was not defeated so easily, this tyrant was but one of many and the fleet of living organisms above would not stop sending more until the planet was gone… or the hive ships were dead. It was in this moment that Marshal Agustus van Trapp realized the truth of the tyranids, the true hive mind dwelt above safely aboard the main hive ship while it sent its lesser minions below to do its bidding. And so Agustus van Trapp left command of the ground forces with Castellon Ocelot and extracted his retinue back to the Divine Crusader. 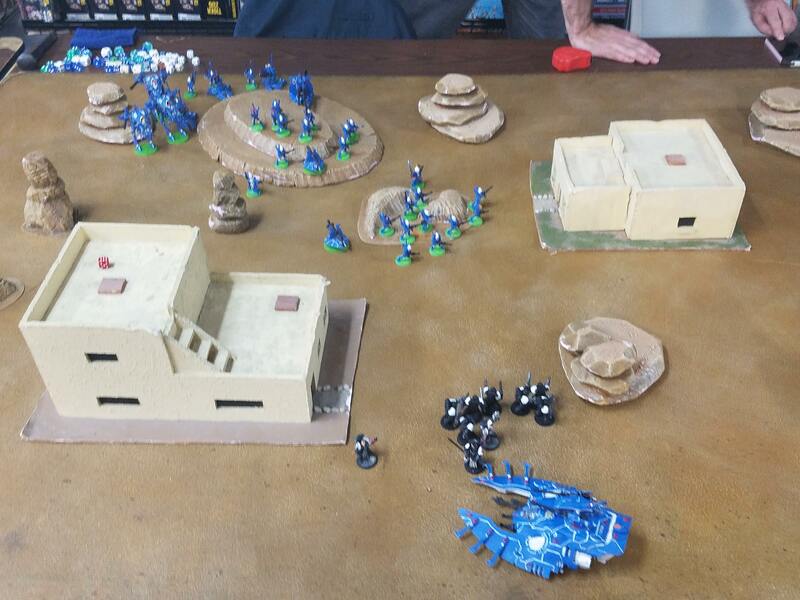 There he devised a plan - an insane plan - that would see the end of the tyranid offensive on Hephestus IV. Van Trapp, champion Rodrick, and a small group of volunteers would load themselves into the boarding crafts and fire them directly into the hive ship, a suicide mission with minimal chances of success, but they would not go alone. The Divine Crusader was equipped with melta warheads capable of reducing cities to molten slag, Agustus would load them into the boarding crafts as well and detonate them as close to the hive queen as possible. This is such a great piece of 40K read. The other thing that's great is that you take your time to write this and share with this community. I'm looking forward to reading more of your fiction and maybe seeing some more posted images of your crusaders! 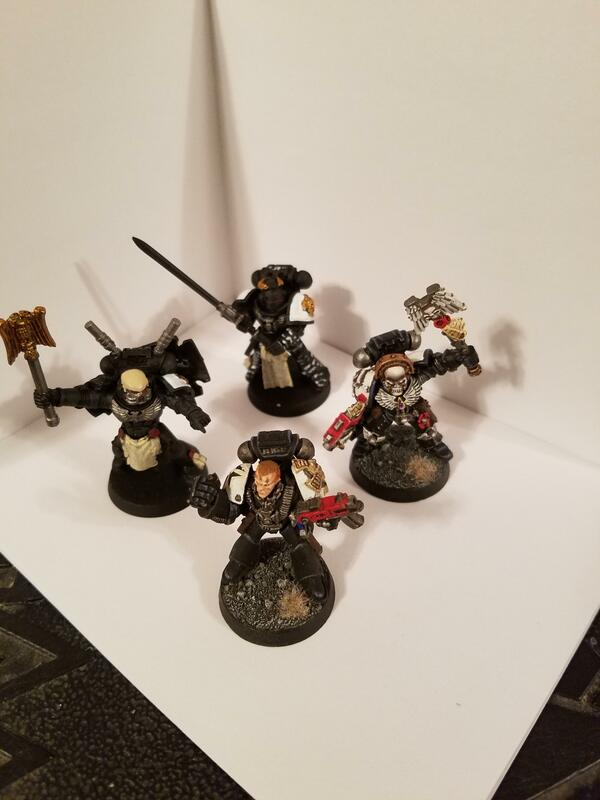 @Brother Cristopher: thank you thats such a huge compliment for me, i think some od the themes are a little cliche but its a labor of love for me to come up with a story for my army. Beside the playing and the painting my favorite aspect of the hobby is the fluff, ive read so many stories about the different chapters and such that i wanted to write my own. I dont pretend that mine is even close to the levels of graham mcneil or dan abnett but they are definitely my greatest inspiration! Augustus van Trapp sat in his meditation chamber performing his holy rites of battle, he could hear the boom of battle around him, the blaring of warning klaxon indicating the Divine Crusader was taking hull damage because of its lost void shields, the shouting of the crew as they hurried to put out fires and keep the ship moving. He knew this was the only way, his time in the Deathwatch had shown him the truth of the Tyranid. Aboard the tyranid hive ship lived a progenitor creature, the ordo xenos called it a norn queen. From this creature all the tyranid bioweapons, warrior beasts, and hive creatures were spawned - like a massive living forgeworld - to be delivered to the world below. It was said that the psychic death scream of the dying creature was enough to send all the other beasts, even the hive tyrants, into disarray turning them into nothing but mindless, instinct driven beasts; a much more manageable foe for space marines. Castellan Falko Ocelot gazed out upon the battlefield of Hephestus V, seeing the destruction that the Tyranid menace had wrought. These xeno scum had blackened the sky, sundered the land, and slain many loyal imperial servants, and that boiled Ocelots blood. He would not rest until every single Tyranid filth was purged from this world, and it was once again delivered into the hands of the Emperor. To accomplish such a task he needed every loyal servant of the Emperor to be ready for battle, Ocelot gave the crusade wide order to rally all forces to the ex-governor's palace. Ocelot and his crusaders carved their way back to the palace, slaying hundreds of xenos and saving any loyal imperials they could find. Marshal van Trapp had given him the ground forces while he enacted his plan above, and he would prove to all his brothers that he was worthy of such an assignment. Augustus van Trapp looked out at his team, his volunteers were Champion Roderick - his personal bodyguard and champion of the crusade - along with Reclusiarch Heinrick, Brother Cadicus - the crusade’s senior techmarine - and Brother Argus and his veteran squad clad in tactical dreadnought armour. Champion Roderick was however missing, in his place stood a warrior clad in the armour of faith wielding the black blade carried by his crusade, Augustus knew at once why the Emperor’s Champion stood before him and he welcomed such a presence on this important mission. “No fear!” echoed back Augustus’ kill-team. They were ready, he knew that his brothers would not fail him, but would he fail? A thought had been nagging at the back of his mind since he first arrived on Hephestus IV, making him doubt his actions and it returned now. The future of this world was now in his hands, and he could not risk doubting himself now! The odds of success looked more and more dismal by the second, as Castellan Ocelot and his men held the line against the tyranid invasion the chance of even surviving this day began to disappear. The Tyranid had overrun the outer entrances to the palace and the crusade had to take up defensive positions within its inner sanctum to hold the beasts at bay. The choke points were holding for now but larger are more powerful organisms were making their way into the sanctum. It was only a matter of time before they were overwhelmed and overrun completely. T-MINUS 30 SECONDS UNTIL BREACHING RANGE! Augustus and his team had loaded themselves into the ship-to-ship boarding craft, along with several melta warheads, and now awaited the moment they would be sent crashing into the nearby hive ship. T-MINUS 20 SECONDS UNTIL BREACHING RANGE! Augustus said his last silent prayers to the Emperor and hoped He would guide them to victory on this day. The fate of the world below and it's citizens all rested upon his shoulders. T-MINUS 10 SECONDS UNTIL BREACHING RANGE! The boarding craft rocketed out of its launch tunnel aimed directly at the hive ship, minor explosions shook the craft but after a short flight it punched straight into the hive ship. With a thunderous blow the craft tore through the hive ship and stopped with a thud. The locking harnesses released and the kill team snapped into action - weapons at the ready - Augustus slammed the boarding ramp down and was immediately met with great warrior beasts. Lashing out with his powerfist, three beasts fell before him. As he cleared a hole for his brothers, more of the monstrosities pushed their way down the winding corridors. Brother Argus leveled his heavy flamer and sent a gout of liquid flames at the charging warriors, incinerating them and clearing a path for the team to move further. As they wound their way through the artery-like passages of the hive ship, the team was met with resistance at every turn. From guard beasts, to the very walls of the ship itself, everything lashed out at them trying to keep them from their destination. Augustus and his team fought their way to the heart of the hive ship, where the supposed norn queen lay creating the brood of the tyranid swarm. They reached a large chamber and at its center was a massive creature with wicked talons and a massive bulbous head. As they entered the chamber the guard beasts parted ways and withdrew into defensive positions. YOU DARE SHOW YOUR FILTHY PRESENCE IN MY NEST?! The words pressed into their minds, intruding their thoughts and setting them on edge. YOUR KINDA IS NOTHING BUT FOOD FOR THE SWARM! WE WILL DEVOUR THE GALAXY AND EVERYTHING IN IT! “Your kind may be without number, but we will cut you all down!” Augustus screamed as he began charging the massive creature but as he started the Champion held out his sword to hold him back. “Together…” an echoing voice spoke from the Champion's helmet. With that Augustus and the Champion charged the Norn Queen. The beast lashed out with its claws as its guard beasts sprung back into action. Brother Argus was ready and used his flamer to keep the guards at bay while they fought. Augustus punched one of the beast’s legs out and it toppled over, ichor spraying everywhere, while the Champion lopped off another of its limbs. The creature was driven into a frenzy and lashed out with its psychic powers, lifting the Champion off his feet and sending him flying across the chamber. Augustus batted one of the beast's limbs away and delivered a powerful blow to its chest, crushing a section on its chitinous plating. The queen stabbed down at him will all its might, impaling him in the shoulder, shattering his pauldron and pinning him to the floor. The Champion was back on his feet and rushed the creature slashing right through the claw that held his Marshal down and another clawed limb before the queen managed to grab him with its other claw. PATHETIC! The queen grabbed the Champion in its jaws and tore his head clean off, throwing his lifeless body at Augustus. NOTHING BUT NOURISHMENT, NOT EVEN A WORTHY ADVERSARY! Looking down at the fallen body of his comrade, Augustus was filled with a zealous rage. He charged the monster with unnatural speed and precision, demolishing its remaining limbs and causing it to slump over on the chamber floor. “I will see your kind exterminated and the galaxy free of your taint beast…” but as the words left his mouth he collapsed, the venom of the norn queen attacking his system faster than it could heal. Heinrick and Argus’s squad formed a bubble of protection around their fallen Marshal as Brother Cadicus armed the melta warheads that had been entrusted to him. “No. Your duty is to the crusade, take the Marshal back to the ship with the armour and black sword, make sure he is rushed to the medicae bay. I have done my duty to the Emperor. I will stay.” said Chaplain Heinrick. And with that order the veterans made off through the ship back to their boarding craft. Heinrick strode over to the bombs and thumbed the activation switch, “Suffer not the unclean to live!” and with a flash the bombs detonated. A brilliant explosion lit the sky over Hephestus IV as the melta warheads detonated aboard the hive ship. The tyranid ground forces were instantly sent into disarray, every creature from the grunt organisms up to the hive tyrants went into a panicked frenzy, reverting to their base animal instincts and tearing each other apart. Ocelot’s ground forces turned the tide of battle in an instant and sent the beasts running, quickly clearing the grounds around the palace and pushing out to clear the surrounding city. Castellan Ocelot roused his crusaders to clear every last xeno filth from the surface of the planet. After several hours of slaughtering tyranid, his men set up a forward base when they received a communication from the Divine Crusader. ALL BATTLE BROTHERS RETURN TO THE GOVERNOR'S PALACE. THE IMPERIAL NAVY HAS ARRIVED TO TAKE OVER OPERATIONS IN THE SECTOR. WE WILL BE LEAVING THE SECTOR IN THEIR HANDS. After the demise of Marshal Augustus van Trapp, the Purgation Crusade was left leaderless, the Castellans of the Crusade unanimously decided that Castellan Ocelot was the best choice to take up leadership of the crusade. 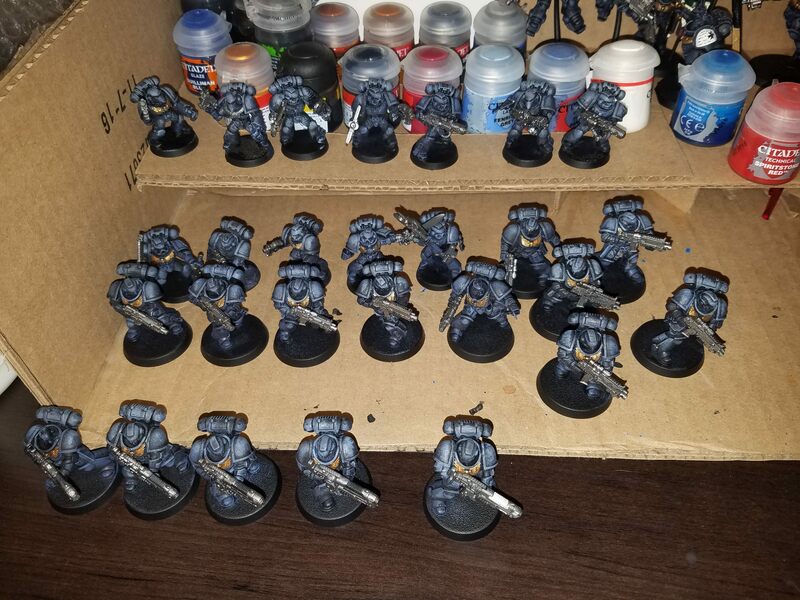 Shortly after the Battle for Hephestus IV, he and several of his brother marines underwent the process to become primaris, seeing it as a gift of the Emperor to bring fiery wrath to his enemies. He is a stern, calculating man, shrewd in his tactics and completely unforgiving of his enemies. 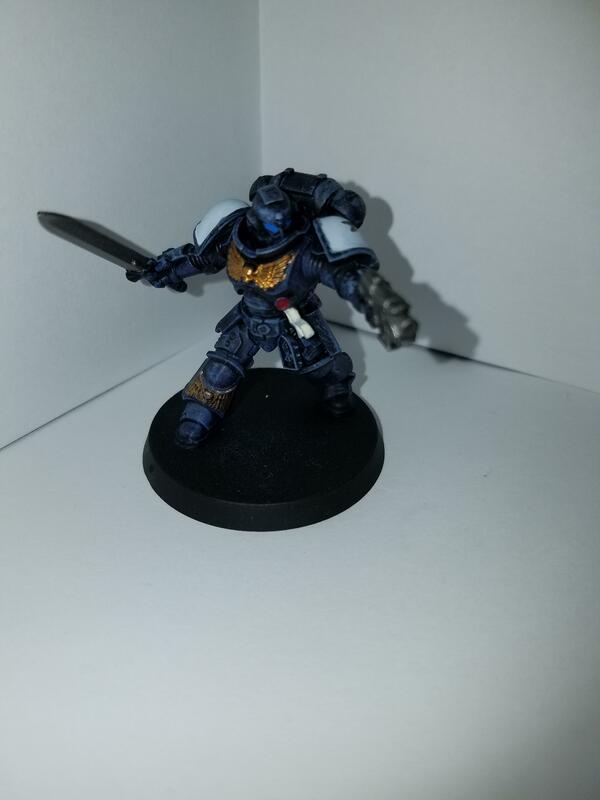 My first official primaris marine, I really love the design of the gravis armor and the captain is pretty awesome in and of himself. Had a lot of fun painting him. Ocelot's second in command, Reinhold is a masterful tactician who leads his men to be the best they are capable of being. His hatred of xenos, especially the orks, has given him the unofficial nickname, "The Alien Hunter". I LOVE the primaris lieutenant models and had so much fun painting them. Especially this guy! Castellan Everard is the head of the Marshal's personal guard, known as The Blades of Fate. They are the Sword Brethren who are charged with the defense of the Marshal and they each take personal oaths to challenge any foes deemed dangerous. 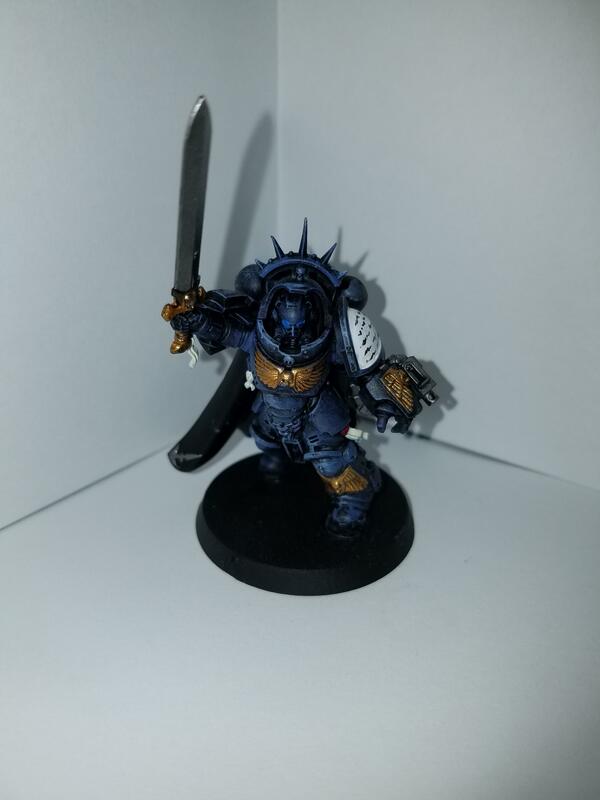 This guy gives me very Emperor’s Champion vibes so I made him the new leader of the Marshal's guard. That's all for now but I'll have more soon I promise! Edited by Marshal van Trapp, 21 October 2017 - 11:06 PM. Again. Great story as always. Dawn of War 2 anyone? Like the writing, there's too little people giving fanfics a go, when it is so entertaining to read! Didn't even realize that you're right, it is a very DoW2 haha, i try my best, i know it is full of cliches but thats all 40k lore isn't it? 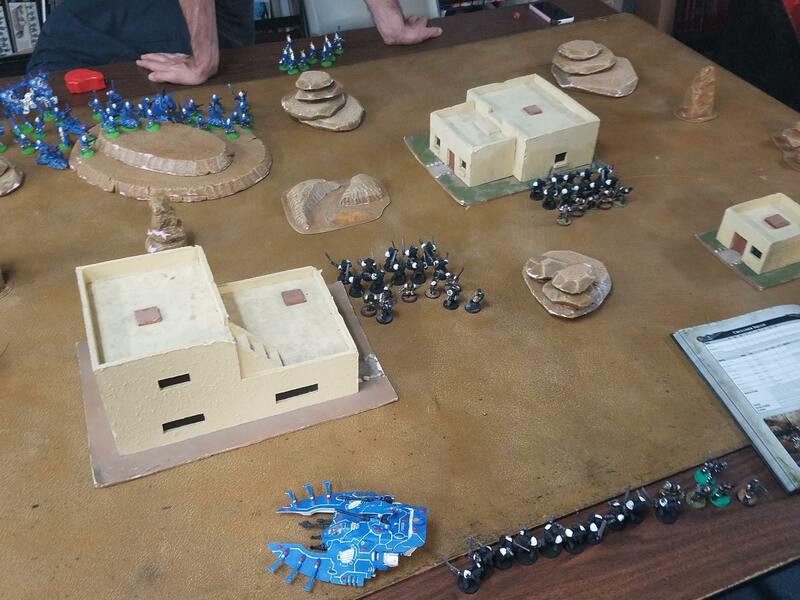 Back again this time with a new battle report, this time a 50pl game vs Eldar which I failed miserably to game properly but more on that later, onto the battle report! Already going into this I was running into open fire but i said ah the hell with it, "FOR THE EMPEROR!" Put all my eggs in one basket setting all my crusaders as close as possible while he clumped all his shooting dudes together and deep striking his serpent. Everything ran up the board! He dropped his serpent behind my lines to try and snipe my chaplain but only hit once and failed to wound, the rest of his army however absolutely obliterated one of my crusader squads and the remaining 2 ran away. Dire Avengers disembark and attempt to hurt my crusaders but fail to do anything, meanwhile his army shoots the other to 7 men and 3 more run away. Full Strength crusader squad assaults the dire avengers with the chaplain and EC killing them all while the marshal assaults the serpent and brings it down to just 3 wounds. 4 remaining crusaders assault his guardians but take 3 casualties to overwatch, remaining marine fights valiantly but dies to weight of attacks. Guardian Squads and warwalkers advance on my position and gun down most of my remaining crusaders while the Wave serpent assaults my Emperor's Champion and of course he slays it with extreme prejudice! The Emperor's Champion slays the Wave serpent! 5. Don't forget my special and heavy weapons at home! Anyway that's it for me, till next time brothers! Edited by Marshal van Trapp, 10 November 2017 - 04:08 AM. At least you are able to take a step back, logically analyze the game, and learn from mistakes. Next time, I am sure the BTs will triumph over the xeno scum. Hopefully I can get them finished in the next couple days and move on to some bigger stuff! We used the open war deck and got a card that made all psychic tests 1 harder and another that made setup go whole army then whole army instead of back and forth. The mission was supple cache and deployment zones were along one short edge or a box in the middle. 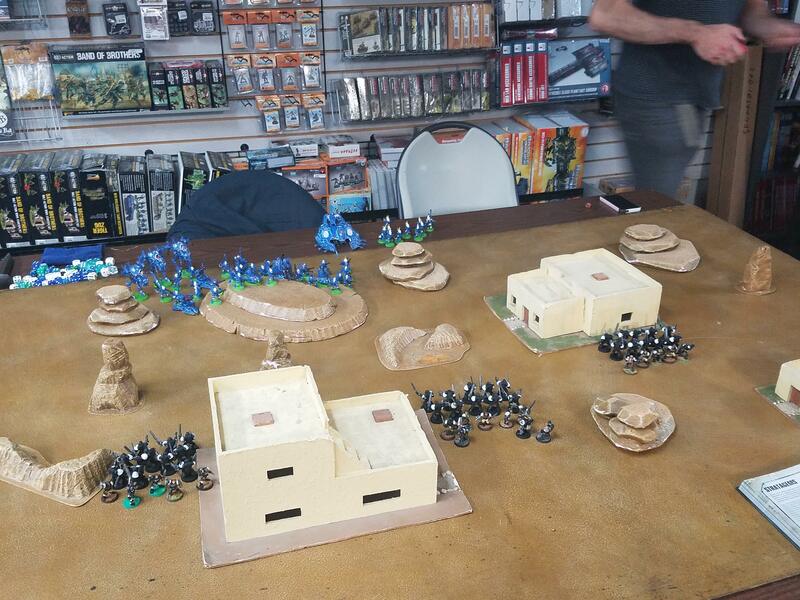 I won the roll for deployment zone choice so i chose the short edge which mean he needed to do the weird center box, he won deployment roll so he set up first, covering all the potential objectives he could. I set up 2 crusader squads each in the upper and lower avenues of the board, one pair backed up by the chaplain the other by the captain and EC. Terminators and vanguard stay in deep strike. Orks won the roll for turn 1 and i failed to seize iniative. He rolls for the three objectives he has covered and none are the supply cache. He moves his boys up into position near another. His weirdboy uses some power to redeploy his cc boys right in front of my crusaders. He then shoots at my crusader squads with all his boys and the weird super tank thing, killing about 6 neophytes total then attemps to charge me, failing his charge rolls. I roll for the 1 objective I had covered and it was not the cache. My two lower crusaders and Chaplain advance to get into prime charge position while 2 upper crusader squads move forward to charge. Vanguard and terminators arrive from the skies to wreck havok. Terminators empty their payload into the shooty boy squad killing 5 while the upper crusaders shot at both the boy squad and super tank killing 3 boys and wounding the tank twice. The crusader squads then when on to assault their targets while one vanguard squad assaulted the weirdboy and the other failed its charge. I started with the combat with the weird boy only just not killing it. He then used 2 CP to interrupt my turn and did his assault on my crusaders killing about 4. I then finished my crusaders killing 5 boys and wounding the tank 4 more times. He rolled a 6 for the last of 2 objectives meaning I now had to fight into his army to win. After falling back with his weird boy and tank he tried to smite my vanguard which was met with the mighty zeal of a denial roll! Afterwards he shot my terminator squad with his trukk, tankbustas, warboss, and shoota boys managing to kill 3 and wound a 4th. After which point he assaulted them with the boys, warboss, and banner nob while his other boys squad assaulted one of my lower crusader squads. 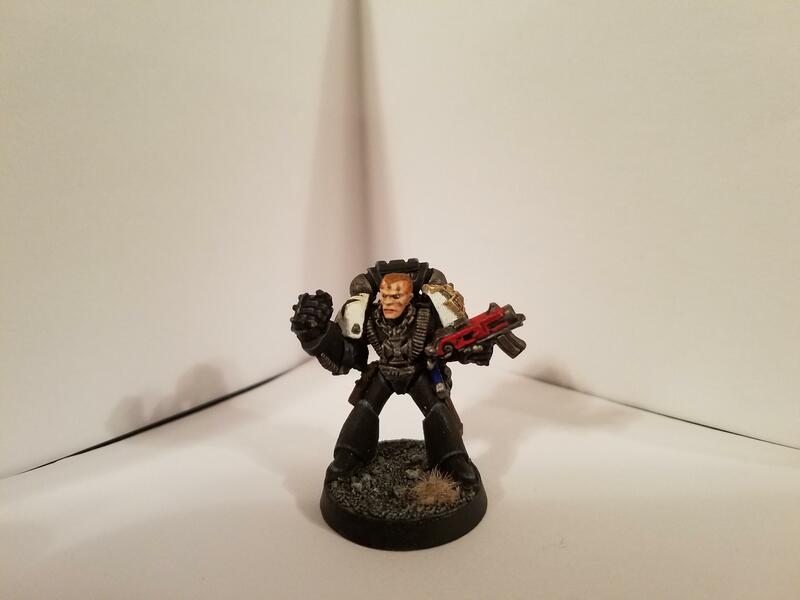 He managed to bring me down to just 1 terminator and completely obliterated the newly charged squad while consolidating into the chaplain and the other. The other crusader squad backed up by the champion managed to kill a few more boys but they passed their stupidly high moral check. The marshal and my other crusader squad moved up to challenge the battle tank again while my vanguard squads moved up to engage the boys on my chaplain and his warboss respectively. Melta managed to strip another 3 wounds from the tank while the pistols actually managed another wound. One vanguard squad assaulted his warboss while the other utterly failed to make their charge (again!) I decided to start with the squad assaulting into his vehicle (a big mistake) which managed to wound it another 3 times with their powerfists. He spent another 2 CP to fight with his boss who utterly demolished my vanguard squad. At this point it was back to ongoing combats where I managed to wipe out one of his squads attacking my chaplain and my EC saw himself up against 6 boys and a nob with only 2 PF initiates to support him. He withdrew His tank again and moved his trukk up to block my lower crusader squad from getting near the objective. His weird boy moved up to try and smite again but was once again denied. The rest was ongoing combats where he finally managed to kill one more of terminators and wounded the other. Remainder of upper crusader squad charged into his remaining cc boyz on my EC while my marshal used the Orbital Bombardment on the boss, to try and kill him but rolled abysmally and only killed 2 boys. The charging crusaders fell on the remaining boys while my remaining vanguard assaulted his trukk. The boys fell to just a bit and a nob bit the trukk took no damage. The lone terminator was finally killed. 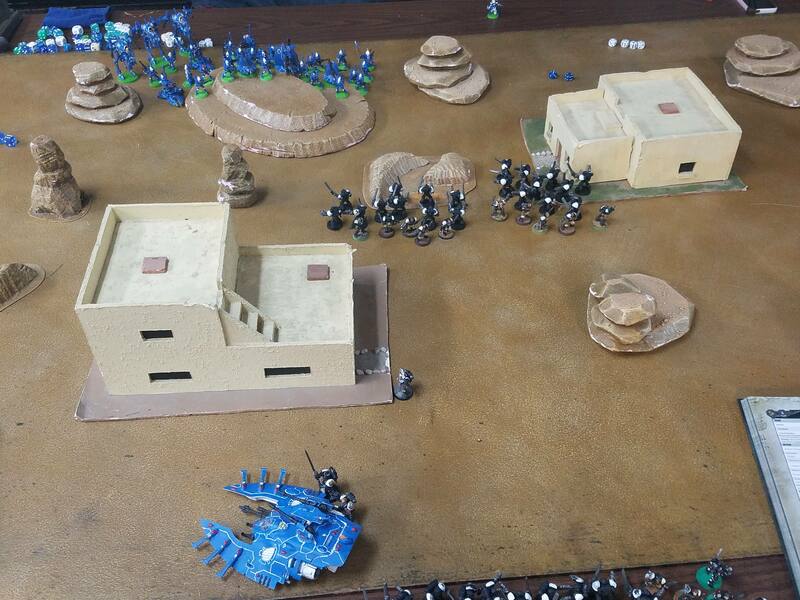 Boss and shoota boys move back towards objective while his tank moved to block my lower squad from advancing. This tankbustas disembarked their trukk while it ran from my vanguard. He shot at my Captain with his tank, dealing 2 wounds while his shootas obliterated my remaining vanguard squad. Tankbustas shot their rockets at my lower crusader squad but failed to kill anything. His nob managed to finish off my EC and my crusaders managed to only kill the other boy. By this point I knew victory was slim so i pushed my lower crusader squad up past his tank and then tried to shoot it down at least a few wounds but managed nothing. The other crusader squad killed his boys and along with the marshal tried to get close to the objective. Ork Turn 5: He shot at my remaining crusaders reducing them to 3 men and then got his charge roll into them at which point I simply called the game knowing that i had no chance of winning. I realized that I put too much chance on the objective being in his deployment or mine, also despite my superior Close Combat tech(power weapons/fists) they didn't really help much against his units as the difference between a 6+ save and no save mattered very little to killing his units. Also my lack of armour coupled with no real anti tank weapons hurt me when the centerpiece of his army (the stupid powerful tank with a 2d6 strength 8 ap -4 cannon) was blowing holes in my ranks. Even if it was firing overwatch on all but 2 turns of the game. I also learned that i hate the open war deck and after the game my opponent even agreed that the deck is kinda unbalanced but that i played a great game for what we both had. Overall I enjoyed the game but i think i need to look into finishing up both my primaris reinforcements as well as my anti-tank dreadnoughts to help my army perform against armor! Edited by Marshal van Trapp, 17 November 2017 - 10:45 PM.